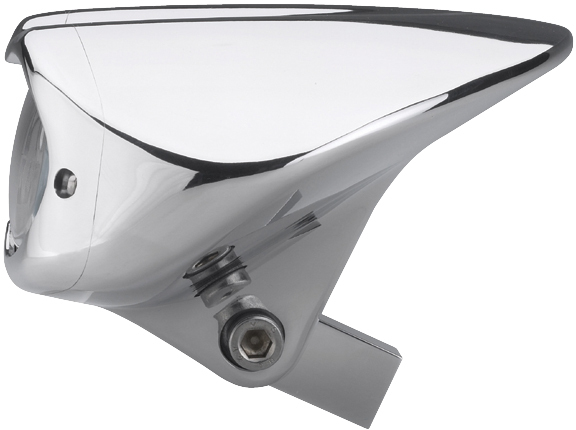 This unique billet custom motorcycle headlight is CNC machined with a manufacturing process which allows to cut billet aluminum with variable curving radiuses (3D machining): the result is a unique product with stunning design. 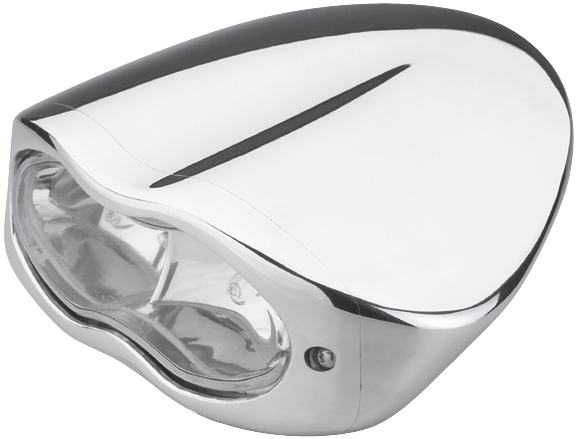 These 3D custom motorcycle headlights are direct bolt-on replacements for the stock Harley lights and can be installed on any chopper, bobber and most custom motorcycles. 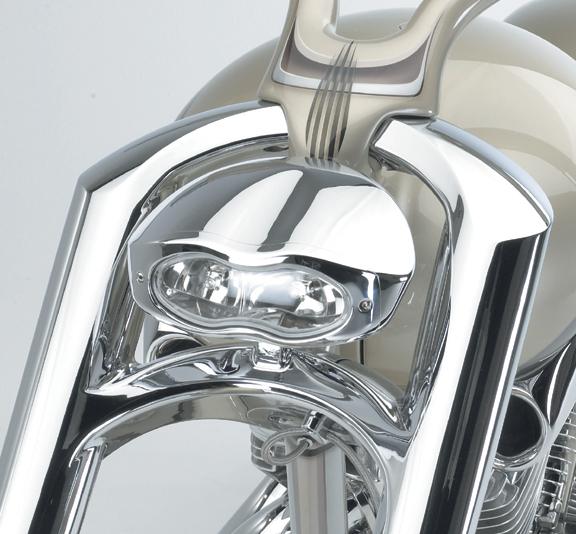 3D Headlights perfectly match the lines of our 3D Motorcycle Front Forks for Softails and of our 3D Front End for V-Rod. Headlamp features high beam and low beam. Candle power: two H-3 bulbs 12V55W. A unique custom motorcycle headlight for top class custom bike projects! Two questions please: 1. Does this (and all other headlights) come in black? 2. 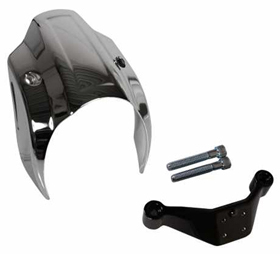 What was used in the bike pictured for the rear fender? Thank you for your interest in Eurocomponents’ motorcycle headlights. Yes, all of our custom motorcycle headlights come in black finish too. The custom bike pictured above mounts a one-off/custom made fender. Do you make the fork to bolt on to metric bikes? How much are handle bars separate and how much is fork. 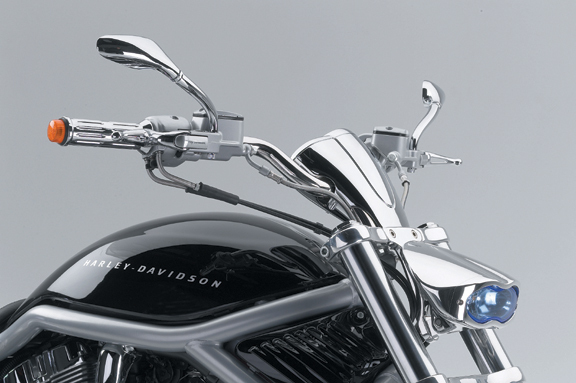 Can you get handle handle bars in the black and chrome? 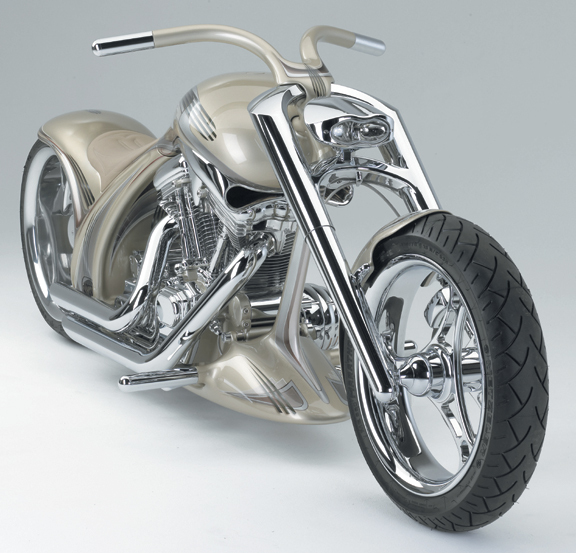 Our 3D forks are available only for Harley’s and Yamaha Roadstar’s. For pricing just click on the BUY NOW link above the pictures. Can the bulbs be replaced with LED lights? 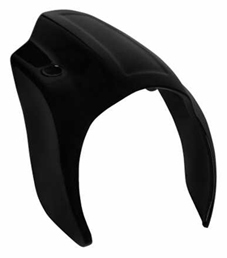 Thank you for your interest in Eurocomponents’ motorcycle headlight’s. Yes, you can probably remove the H3 bulbs from the headlamp and fit some LED’s in place of them. We never tried, so we cannot tell for sure.